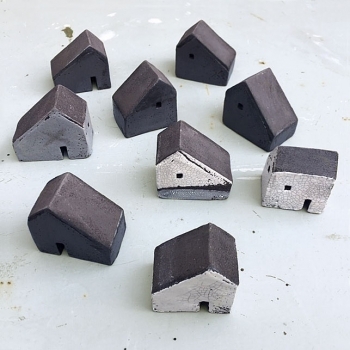 Rowena’s current range of small ceramic houses are hand carved from slabs of black clay, she has developed an approach to decoration and firing that results in surfaces that show a real and implied history and are intended to evoke reminiscence and contemplation. After studying fashion design at St Martin’s School of Art and a first career as a fashion designer, Rowena returned to her first love of ceramic sculpture and took an MA in Fine Art. She recently moved to Iona, in the Hebrides where she has built a house and studio. The croft houses on Iona serve as inspiration for her work, which is exhibited across the UK and aboard.